Delone Carter has the potential to be a steal if he gets drafted in the 3rd or 4th round. I think he has feature back potential. Positives: Good size and very well built, great strength and leg drive for his size. He has pretty good burst and speed and runs with good pad level. He runs very tough and hard, especially for a guy his size. He churns his feet after contact and consistently gets yards after initial contact. He attacks defenders in the open field and runs through tackles effectively because he gets low and has strong legs. He has pretty good vision and runs patiently as he waits for his blocks to set up. He also showed much better hands than I expected in Orlando, so much so that I jokingly asked him in an interview why they didn’t throw him the ball more when he was there. Negatives: He has some character concerns as he has had academic issues in the past and was suspended for a one punch fight, supposedly stemming from a snow-ball fight. He needs work as a pass protector and he will have some durability questions because of his size. He doesn’t have great speed to rip off huge runs in the NFL and won’t get the edge nearly as often in the NFL as he did in college. Overall: I really like Delone Carter’s game and I think he could be an absolute steal in the mid-rounds. I think he can be a starter in the right offense, though I don’t think he would be a great fit for a man scheme as a feature back. He has good burst, speed, vision and he runs very hard and I love that. He really impressed me as a runner against Kansas State in their bowl game and he carried that momentum to the East-West Shrine game practice field. I think Carter has steal written all over him, so it will be interesting to see if he pans out. Hopefully he doesn’t have any off-field issues and he develops into a quality NFL starter. Projection: 4th round. He won’t go high as other smaller backs because he might have some questions about off-field issues and he doesn’t have game-breaking speed but teams will sleep on him because of his size and I think he will surprise a lot of people with his production in the NFL. Devlin looked a bit better today, he had a couple nice throws that showed good ball placement and accuracy, more like you might be used to if you’ve seen him play in college. His arm strength isn’t as good as I have heard some say, it’s solid but his zip is only adequate on his throws. Because he is at Delaware people are naturally hoping for him to be the next Flacco with a rocket arm, but he is a more accurate passer with only above-average arm strength in my opinion. His progression to a QB who plays from under center will take time, but he bobbled the first two snaps he took from under center when warming up this week, so even though I think he bobbled one today he has certainly showed improvement, and that’s all you want to see with a QB moving from a spread/shotgun offense. I was a big Cooper fan before his injury so it’s good to see him playing again and getting his quickness back. There were a few times today that you could notice his quickness and burst coming back when his offensive line allowed penetration and he was able to quickly change direction and find room to run. He seems to have good vision, he definitely has some of his burst and quickness back which is great to see. His injury was a pretty bad one. He looked good catching passes out of the backfield as well. So with his speed coming back (his 40 time will be important for him as well as other times at the combine), him running well, catching the ball out of the backfield and potentially adding value on kick returns (if he is truly coming back healthy he can be a very valuable returner) he definitely warrants a mid-round pick if he checks out medically. Good to see him back! Hopefully I’ll be able to talk to him tomorrow. Carter has been the most impressive back this week in my opinion. I think he is probably the best feature back prospect here. He’s short but well built and he has huge legs, especially for only being about 5’9”. He generates a lot of power, has shown good speed, quickness and soft hands out of the backfield. He has definitely helped himself this week and continued his strong play after his huge game against Kansas State in Syracuse’s bowl game. I’d love to interview him as well. I love Sherman as a FB prospect. He runs hard, keeps his pads low and has good hands out of the backfield. 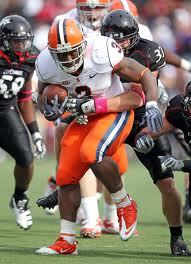 He has impressed me this week, and I think he definitely deserves mid-round consideration as a fullback in the NFL. Toliver has had a good week of practice and continues to show his good hands, flash good route running and showed a little ability to catch the ball in traffic today. Largely I think he is a finesse receiver, which isn’t a bad thing, but it limits his potential when going over the middle. However, he has officially been invited to the Senior Bowl next week to replace Jerrel Jernigan, who was injured while training apparently. It’s too bad for Jernigan, but it’s a great opportunity to show what he can do against even better competition in the Senior Bowl. I really like what I have seen from Baker this week. He’s extremely skinny and while he doesn’t have a huge frame he definitely needs to add weight and get stronger overall, especially in the arms and legs. However, he does have strong hands and he showed that on the field and when he gave me a firm handshake when I introduced myself. He looks like a totally different player than he did at the beginning of the first practice and I am glad that he progressed so much this week. He even had a nice block on a safety today with a lot of pop! I never would have expected him to hit like that. He is definitely a draftable player and I think he has a NFL future in the slot. His route running has definitely progressed this week, he has been creating consistent separation on the corners on the East this week. Hairston is a huge guy and has long arms (34.75 inches when measured) and I think he has some potential at RT. He has a solid punch and shows the ability to use his long arms to keep the defender at bay, and did a good job of forcing Trattou wide during one on one drills. He struggles with speed and I don’t think he has very good feet, but he has potential value at RT. Arkin started off well but has struggled a bit the last couple days. I think he could stand to get stronger in the lower body which would help him anchor as a pass blocker and get more drive as a run blocker. He’s a small school guy and he has shown some ability against better competition, but Martin Parker has beaten him a number of times this week. I think he has some ability, but is probably a mid-late round pick after what I’ve seen this week. Maybe 5th round? Parker continued to impress today and he did a good job getting off the ball and showed a nice swim move in one on one drills. It is clearly his go-to move, but it is apparent that he needs to develop other moves to use because he went to the swim move well a couple times too many and became a bit predictable with that move right off the snap. It works, but he needs to develop other moves to help keep the blockers off balance. But he has good size, arm length, quickness off the ball and he has a good swim move already. He has definitely helped himself this week, and I think he’d be a good fit in a scheme that asks their defensive linemen to penetrate and get into the backfield. Austin continues to impress, but I think it is fair to say he is not quite in football shape yet. I don’t know if he will garner a late invitation to the Senior Bowl, but I would love to see him there if he did get an invitation. He has looked good this week, shown some violent hands, has drawn a number of double teams, but seems to have worn down as practice goes on. He isn’t carrying too much weight, I just don’t think he is used to playing football like this yet because of his time off from the game. He has definitely helped himself this week, but we all know he had ability. I just want to see consistency from him which we haven’t exactly seen yet. I have seen him get blocked one on one in pass protection a number of times this week which isn’t necessarily a bad thing, but he has the ability to dominate some of these guys and I was left wanting a little more in that regard. I haven’t had a lot of notes on McClain up until this point because he never really stuck out to me. He’d get into the backfield here or there, but I don’t think he is good enough off the snap to consistently penetrate into the backfield in the NFL. I think he might have some value as a space eater as he has a wide build, long arms and stocky size at 6’1.5” and 305 pounds. That should net him mid-late round consideration, but I haven’t seen a ton from him as a pass rusher. He had a nice spin move on Ryan Bartholomew today in one on one’s, but like I said I have only seen a flash every once in a while of him penetrating or collapsing the pocket this week. I haven’t had a lot of notes on Trattou this week either, but he has solid size, arm length and good hand usage. He doesn’t have much speed off the edge, so weighing in at only 254 pounds will really hurt him. He has struggled to get the edge in one on one drills this week with speed, so I don’t think he will be much of a speed rusher in the NFL. I think he will have to dedicate to filling out his frame to be a rotational DE in a 4-3 or maybe really bulk up his 6’3” frame and try to get to 275+ to try playing 3-4 DE. That’s a lot of weight to put on and while I definitely think he has room to add weight I don’t know if he has room to put on 30 pounds or more. He seems to be a hard worker though, and like I said I like his hand usage and strength, but right now he is not fast enough off the ball to consistently rush the passer at 4-3 DE and he is way too small to hold up at 3-4 DE. Dent continues to fill well, get in position to make tackles and generally be around the ball (especially against the run). I don’t think he is a perfect fit for a 4-3 because he has some struggles in coverage, doesn’t have very good hips and I’m not sure how well he runs, but I think he is a perfect fit for a 3-4 ILB. He plays so well downhill, has such a great knowledge and understanding of gap responsibility, and even though he hasn’t been able to show it this week I think he has good value as a blitzer. I will hopefully have an interview with him as well as a number of other guys, but I am really high on Dent (especially as a 3-4 ILB). Greg has had a good week, continues to flow to the ball well, show good instincts and get in position to make tackles. I don’t know where his stock is at right now, but I really like him as a 3-4 ILB prospect. I’d say Dent is a better inside linebacker prospect at this point but I have seen more of him than I have of Greg. I will definitely have an interview of Greg this week and just in talking to him a bit after practice he seems to be a great guy, very smart and easy going. I have a feeling he will impress in interviews, and he seemed to take control of the defensive unit he has played with this week each day which I love to see. Miller has a great motor, he is a heads up player and he has solid speed, but he just doesn’t have the get-off or the edge speed to stick at DE in a 4-3. His arm length has hurt him this week as he has struggled to get off blocks from guys with longer arms like Jah Reid and Chris Hairston, both of whom have struggled with speed this week. I have heard he will have to move to linebacker, but I think his only hope there is to move to inside linebacker, probably in a 3-4. I don’t know how he is in coverage at all, but even if he doesn’t have an ideal position as a starter on a defense I think he definitely warrants late round consideration or priority free agent value because of what he could bring as a special teamer. His motor, effort, heads up play and tackling will be valuable there even if he doesn’t fit in perfectly in any scheme at the next level. Rogers continues to have a good week. I like him the best out of the four corners on the East, and I like him about as well as I like Lindsey on the West. He has pretty good footwork, closes well, has long arms for his size and has generally just been good in coverage this week. He has definitely helped himself. However, he doesn’t have very good hands for the interception despite his ability to make plays on the ball to deflect it away, and he has small hands. I don’t think he will ever get a lot of interceptions at the NFL, but a guy with his closing speed and vertical could definitely get his hands on some passes. Thanks for reading! There is still more to come. Hello to everyone from Orlando! I am here all week for the East-West Shrine game practices and the game on Saturday. I look forward to taking a lot of notes and of course posting my thoughts at night on my blog for all to read! So enjoy the notes from the East practice that I just finished up. The West notes will be done later tonight as well. Devlin had a solid day. It didn’t start well when he bobbled the first two warm-up snaps he took under center, which kind of worried me at first. However, he didn’t bobble any snaps the rest of the practice that I saw. He was throwing a little high early and got intercepted on his first throw thanks to a tip by a corner once the ball got there. He seems to have pretty solid size, solid zip on his throws. He has long arms too as far as I could tell without measurements. Taylor had a solid day too, and it was big for him to measure in at 6 feet. He looks small on the field, especially next to Devlin. He was a little erratic today, missing high and low, and struggled with ball placement some. His passes definitely had the most zip on them of the East QB’s. Dobbs is not much of a passer, and his only value at QB at the next level will be running wildcat or something. His spirals weren’t very tight early, struggled with ball placement and didn’t seem to have very good zip on his throws. Cooper was handling kick returns early in practice, though they were just walk-through kickoff drills. He was extremely fast before the injury, and it looks like he is returning to form a bit. It’s hard to say for sure, but he looked fast today. Showed soft hands today in drills too. I don’t think I saw him drop a pass. Carter looked great today. He looked very fast, got upfield quickly, made some really nice moves in open space and to get into the open field. He had an incredible game against Kansas State and he played like he still had momentum from that game today. He looked the best out of the RB’s on the East to me. Royster lacked burst like he seemed to on tape in my opinion. Doesn’t explode in or out of his cuts at all, doesn’t seem to have very good footwork as a runner. I wonder about his vision too because he shuffles his feet and takes extra steps when the play is developing instead of finding a hole and making a cut to hit the hole. He looked really slow compared to Cooper and Carter too. Sherman really stuck out to me. He showed great hands out of the backfield, especially for a fullback, and seemed to have good vision as a runner as well. He looked great today. Toliver looked like the best receiver on the East today without a doubt in my mind. I was high on him coming into practice, but only one pass thrown to him hit the ground that I saw. He dropped it but every other pass he caught easily. He seems to have pretty big hands, really long arms and he catches the ball well away from his body. Seemed to try to catch and turn too quickly on the one he dropped. His legs are really skinny though and he himself is skinny, and he doesn’t have much explosion out of his breaks to create separation. If he gets stronger in the lower body and works with a good receiver coach on that I think he could improve in that area, but it’s a concern for me at this point even though I love his hands. Jean looked skinny overall but not as skinny as a couple other guys. Coaches were working with him on his stance a couple times early in practice to help him get off the ball better. He was body catching for the majority of practice when I saw him. Plus he was wasting steps in and out of his breaks, most notably on curl routes. Baker started off horribly in this practice. He looks extremely skinny, especially in the legs, and he was dropping everything early. I saw him make one catch and drop every other ball in the first round of receiver drills. He seemed to be really nervous and was not running good routes during that time. However, he has great speed and definitely looked like the fastest receiver on the East squad to me. Not only that, but he calmed down as the practice continued and made a couple of good catches with his hands and away from his body late. He definitely started slow but he made very obvious progression throughout the practice. Shorts had a solid day. He made a couple catches but also dropped a couple catchable balls. He looked like he had a solid frame, definitely not skinny like a couple of the other receivers. I’m not sold on his hands yet, but he has some speed. Smith had one good catch in the beginning drills but he dropped a few passes that he definitely should have caught. He also had a couple false starts and struggled with ball placement initially as a long snapper, but he seemed to get better with that as he went along. Overall though, not a great day. Gantt had a false start and also had a pretty funny moment during blocking drills when he planted his foot and his foot went right through the side of his shoe, tearing a huge hole in the side of his shoe. He had to come out of drills and get a new pair of shoes before he could continue. Hairston is a huge dude, but he looked like he was carrying some extra weight. I don’t think he has the foot speed to stick at LT, but he is working out at OT. He has solid technique based on what I saw today, but his feet look heavy and he lumbers a bit at times. It’s something I will look out for this week. He did a good job of bending at the knees and not at the waist in drills from what I saw. Reid is a big guy and was spending time at RT today. He has pretty solid fundamental footwork but in drills he was bending at his waist a lot which is definitely a concern. It’s hard for him to get leverage because of his size, but bending at the waist is a definite red flag and I saw him do that a number of times. Hutt had a pretty bad day today. He had three false starts I believe and he struggled in the run game, and especially had trouble with Marvin Austin. Arkin is a small school guy that I had not heard of before I saw him on the roster, so I was anxious to get a look at him. He had a couple of false starts, but other than that he looked great today. One of them was on the first play when Marvin Austin was lined up right in front of him, so I’m sure he wanted to get off the ball a little quicker than normal. He looked very good at the point of attack today, had a nice pancake block on Martin Parker, a DT from Richmond. He held up pretty well in pass protection too, though Parker got leverage on him and drove him slowly into the personal space of the QB today. When the ball was thrown they went at it for a second or two afterwards. But Arkin had a great day. Browning had a bad day. He got pulled quickly for Hunt and had two false starts that I saw. He is listed on the West Roster but he was moved to the East team for practice today. He has really big legs and moves well which is important for an interior lineman. He’s listed as a center but I am pretty sure he saw time at guard. He had a solid day today, I look forward to seeing more of him this week. Bartholomew had a solid day of practice. I don’t have a lot of notes on him, but he did a good job of sealing on a couple blocks and spent time at guard and at center. Versatility is huge and if he can play center and either or both guard spots it will help his stock. I was really looking forward to seeing Austin play, especially because I am a big UNC fan. He had a very good day today, though that is to be expected because of his talent level. I have never been convinced he has a very good motor, but he has pretty violent hands and he shed blocks pretty nicely today. He was pretty disruptive and had a couple nice swim moves to get into the backfield. He looked pretty good at the point of attack and when he didn’t shed blocks he didn’t get pushed off the line. He also had a pass deflection at the line of scrimmage today. He had a strong practice, and I am trying to lock down an interview with him at some point this week. Parker didn’t have a great day as he struggled a bit at the point of attack against Arkin, but he plays with good natural leverage because he doesn’t have great size. He had a pretty good bull rush but the QB held onto the ball a long time which gave him more time to slowly drive Arkin into the pocket. I like Rolle but he looks SO small out there. He measured in under 5’10” today and that will hurt him a lot as a prospect. He was getting washed out in the running game today which is not going to endear him to scouts. He needs to add weight to his frame and get stronger if he is going to have any chance of holding up in the box. I didn’t pay much attention to him in coverage, but I will do that later this week. But his size sticks out to you right away, but I am not someone who will be scared away from a guy because of his size. For that reason I will look forward to seeing him show me his ability that got him this far the rest of the week. Greg looked good today. He is a pretty big guy and has a great frame to add weight to. He seemed to be the emotional leader of the East’s first unit today and he was the one calling guys into the huddle and telling them the play they were going to run. That’s always great to see from a player, to see him take command, etc. He was filling well versus the run too, but it was only a walk through. He seems to have pretty good instincts and recognition skills. I liked what I saw from him. Dent is another guy that I am high on. Hopefully I will get an interview with a few of these guys, and Dent is definitely high on my list. He is an absolute tackling machine and he is always in position to make tackles. He fills very well against the run and seems to have a very good grasp of gap assignments and responsibilities. I’m not sure how well he will run, but he plays very well when he can play downhill and though he couldn’t show it today he is a great tackler. I don’t have many notes on him, but he had an interception off of a tipped ball by Justin Rogers today. Rogers looked pretty good in coverage and seemed to close on the ball pretty well the few times I saw him. He had a pass deflection against Devlin that led to an interception by Lutrus as mentioned above. I am going to keep an eye on him this week to be sure. Sorry about the lack of notes on the DB’s from today. I’m sure I’ll have more tomorrow. It was a lot to take in at first but I got better at taking notes as practice went along. I am really excited to see everybody in pads the rest of the week instead of just helmets today. Hope you enjoyed the notes and look out for the West notes later tonight and notes on both teams the rest of the week! Also check out NFLDraftMonsters.com for updates from me and Ben Allbright all week. Thanks for reading!